In the southern region of Extremadura, between Caceres and Seville, is the delightful town of Zafra. Located at the base of the Sierra de Castellar Mountains, very little is known about its origin, however there is evidence that it pre-dates the Romans. Although the economy was mostly reliant on sheep and cattle, the earlier inhabitants also kept horses for war, putting up a very good fight when the Romans tried to invade. Unfortunately after the Romans came the Arabs, who ruled over the region of Extremadura for another two hundred years before they were eventually driven out by the Christians in the 13th century. The main square in Zafra is the Plaza Grande, and is distinctive because of the arches that line it. If you walk through the Arquillo del Pan arch you will come to a smaller square, the Plaza Chica. Both squares are delightful and filled with cafes and bars where you can relax and soak up the atmosphere. The main places of interest in Zafra are the Palace of the Marques de Solanda, the Santa Clara Covent, and the 15th century hospital founded by the Duke of Feria in 1446. The Duke’s castle was quite impressive in its day with nine battlement towers and was where many infamous guests stayed such as the Conquistador Hernan Cortes. 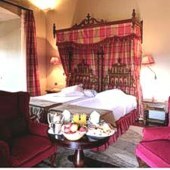 Nowadays it is the Parador Zafra (Hotel Duque de Feria) providing both an atmosphere of elegance and comfort. Throughout the year the town gets together to celebrate several festivals. The Semana Santa is during Easter and is one of Spain’s most famous celebrations. At the end of June is the 17th century festival Luna al Fuego. Or perhaps the International Rancher's Fair might appeal, which starts the last week of September and lasts for two weeks. There are also many activities in the area to enjoy such as walking, horse riding, or mountain biking. If you have a car at your disposal, there are some very special drives you can take passing through some interesting villages and towns. The Duchy of Feria route passes through some beautiful countryside, and your first port of call should be the town of Salvatierra de Barros with its imposing 13th century castle, narrow streets, and pottery workshops. These workshops are fascinating to visit as you will get a chance to see the clay worked and moulded using the traditional methods. Other towns along this route include Feria, which holds particular historic interest as the centre has changed very little over time. On a clear day you can see over 22 villages in the distance from the top of the castle tower. An alternative route is the Knights Templar. 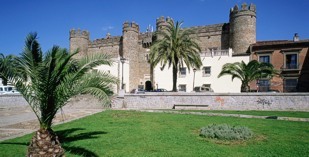 Only 10km from Zafra is the town of Burgillo del Cerro which lies at the foot of the Knights Templar Castle. Apparently, after a smear campaign by the King of France, the Knights Templar were accused of heresy, and the Order was unfairly dissolved by the Pope in 1312. If you visit the town of Jerez de los Caballeros you will find the Torre Sangrienta (or Bloody Tower). Having sworn their alliance to the Order, the Knights of Jerez were forced to either give up their land, or die at the stake as heretics. Instead, they valiantly decided to fight to the end. It was in this tower where they were eventually beheaded, and their bodies thrown over the side. Most of the villages and towns along these routes were protected by fortresses, and Fregenal de la Sierra was no exception. Its imposing castle, built in 1283 has a huge parade ground inside that was later turned into a bullfighting arena. This delightful town has an abundance of attractive parish churches, and quaint cafes and bars – a perfect place to stop for lunch. After lunch, if you wish to continue following this historic trail, carry on to the Coto Mountains which are only 6km away. There you will find an archaeological site of Celtiberian and Roman remains dating back to the 3rd century. With such a colourful history, Zafra and the surrounding towns and villages will certainly give you an opportunity to learn about this particular region’s dramatic past. Although Zafra has the benefit of a train station only 1km away, if you did not arrive by car do consider hiring one, as it would be a shame to miss out on all there is to see.